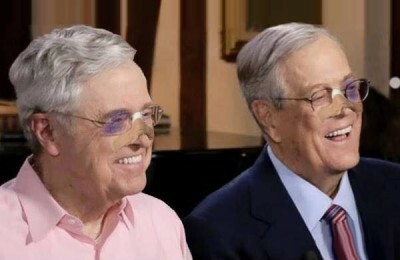 The Koch brothers have decided that they will have to be the Republican presidential candidates themselves. “There’s not one electable one in the whole group!” shouted David. “Sixty-eight percent of the voters hate Trump, and Cruz can only really count on the Tea Partiers — he’s too Latino for Whites and too White for Latinos,” his brother agreed. “By the way, who even knows who this Kasich guy is anyway. I had to have one of my aides look him up for me, for God’s sake,” Charles shook his head. “Trump’s always been a loose cannon, but now they’re all losers!” David smacked his fist into the wall. In the end, they decided they had only one option — they would have to run as the Republican presidential candidates themselves. They have delayed the announcement, however, until their black eyes and broken noses heal after they slugged it out to see who would be the presidential and who would be vice presidential candidate. Feeling mellow from the sedation for their nose repair, they finally came to a compromise, they could become the first co-presidential candidates ever. “How can anyone object, after all, we own the Party,” Charles laughed through his fat lip.